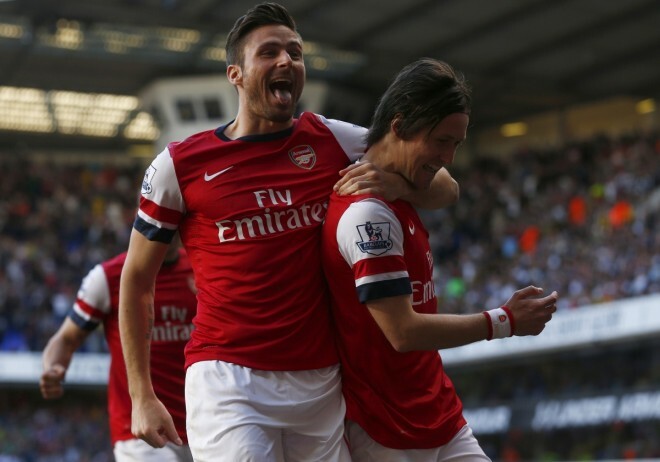 The North London derby is swept by Arsenal this season, giving a atypical defensive, combative and sluggish performance at White Hart Lane, claiming an ultra important 1-0 win over Tottenham thanks to a sublime Tomas Rosicky goal, putting back in direct contention of the Premier League title. For Tottenham this was the continuation of an awful week: Losing to Chelsea 4-0, losing at home to Benfica in the Europa League and now to Arsenal. The realization that they don’t belong to the top 4 or even remotley close to Champions League football, and that the euphoria of their managerial change was a bit early considering the two have pretty much gotten the exact same result, only Villas-Boas seemed to offer more hope for the future. Arsenal came to defend and poach a goal, and got that right off the bat. An excellent interception by Alex Oxlade-Chamberlain, once again showing his place is in the middle and not on the wing, released Tomas Rosicky on the right side to score a beauty of a goal, only his second season, with a swerving ball with the outside of his boot from the edge of the box. Tottenham were the dominant and more dangerous team in a match with more dangerous challenges than anything else. Eight yellow cards were given throughout the match, five of them to Spurs players, who did trouble Wojciech Szczesny but not enough, with most of their chances coming from outside the box. Tottenham started out the second half with two excellent chances, both falling to Nacer Chadli. If the first wasn’t really a miss but more of a slow reaction, the second one was another mistake by Szczesny, dropping the ball and leaving Chadli with an open goal but two defenders that blocked a bad shot from the Belgian. Arsenal had their best chance aside from the goal in the first half, as Oxlade-Chamberlain missed in a one on one situation with Hugo Lloris, trying to chip the ball clumsily instead of passing it to a wide open Lukas Podolski. Tottenham need to stop dreaming big and concentrate on reality – trying to finish at fifth or sixth, hoping that Everton and Manchester United don’t catch up. Arsenal have only one non-league distraction left, hoping that even without great football they can get good results to help them do more than just a top 4 finish.